The global recorded music business generated wholesale revenues of USD $17.4bn in 2017 – up 8.5% year-on-year. According to calculations from Midia Research, this figure represented year-on-year growth of $1.4bn, taking the industry back to its highest level since 2008 ($17.7bn). This increase, says Midia, comes after global recorded industry grew by over $1bn in 2016. Perhaps the most surprising element of Midia’s numbers concerns independent artists. Calculating revenues generated via the likes of Tunecore, CD Baby and Bandcamp, Midia reports that ‘self-releasing’ acts collected $472m in 2017, which gave them a 2.7% market share. That $472m figure was up 27.2% from the $371m which Midia calculates independent artists took home the year before. Universal Music Group claimed the biggest global market share of the major record companies. Its $5.16bn in revenues resulted in a 29.7% worldwide share (inclusive of independent artists), says Midia. Warner saw the strongest growth of any major, however, generating $3.13bn, or 18% of the global market. Sony generated $3.64bn to claim a 22.1% market share, while the independent labels collectively generated $4.8bn – a 27.6% market share. These figures are based on distribution revenues, with Midia’s Mark Mulligan explaining that “much additional independent sector growth was absorbed by revenue that flowed through digital distribution companies owned by major record labels that were thus reported in major label accounts”. 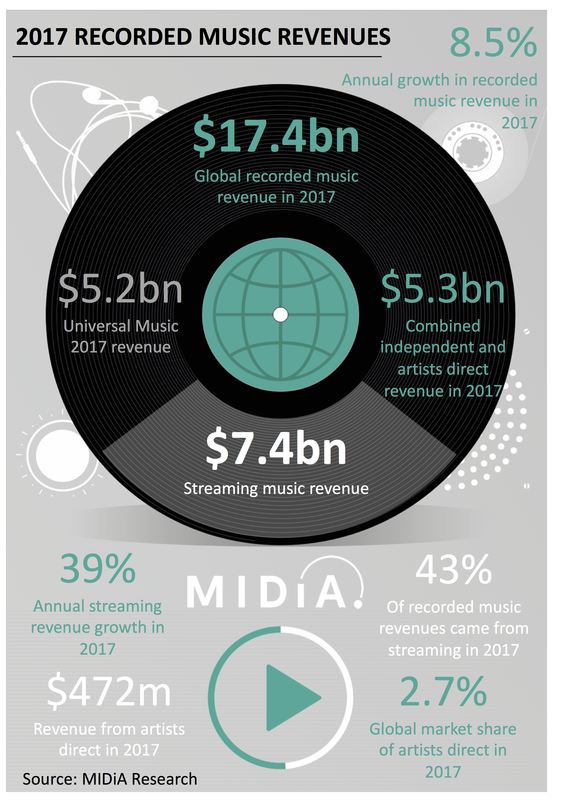 Either way, independent artist revenues plus independent label revenues accounted for a global total of $5.3bn in 2017, says Midia – slightly ahead of Universal’s overall recorded music sales. Total industry streaming revenues grew 39% to $7.4bn in 2017, representing 43% of global wholesale revenues.